It is that time of year when CEO compensation is revealed and debated. The Los Angeles Times just published its list of the 100 highest paid executives in California for 2015. At the top of this list were co-CEOs Mark Hurd and Safra Catz of Oracle, each of whom received total compensation of $53.25 million. A lot of money to be sure, but as most compensation analysts note, not unreasonable given the impact their decisions can have on Oracle shareholders. But if shareholder benefits are to be the basis for evaluating CEO compensation, how are shareholder benefits to be measured? It seems like an obvious benchmark would be the company’s stock price performance during the year in question in relation to the overall market to and to an industry index. Unfortunately, such a comparison is highly misleading. To see why remember that stock markets are forward looking. Today’s stock price depends on investor expectations of a company’s future performance. Suppose, therefore, that company X hires the LeBron James of management. At the time of the hiring, the stock price will jump to reflect the increase in future performance associated with having LaBron as CEO. Assuming that in the year ahead LeBron outperforms all his competing managers as expected, the stock price over the course of the year will not beat the market and industry indexes because it already jumped at the outset. If stock performance is not an appropriate metric, does the stock market provide any other indication of the value of CEOs to investors? In my view, the answer is yes – the distinction between assets in place and growth options. (See my previous post on the value of growth options.) If most of the value of a company is due to assets in place, it means that a majority of the company’s value comes from milking currently existing products and technology. No doubt a difficult task at a huge company, but hardly as difficult as innovating and developing new products. If most of a value of a company is due to growth options, it means that the market has faith in the ability of the company to innovate and create new products. What greater kudo could there be for the CEO than such a market belief? Viewed in that light, it becomes evident how valuable certain leaders can be. The chart below compares Oracle, Amazon and Facebook. 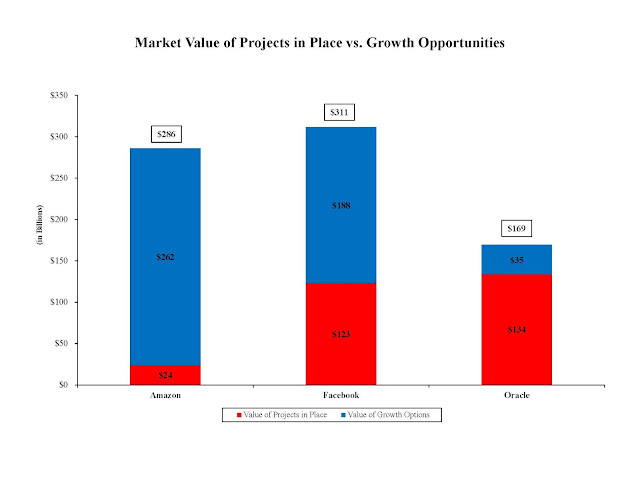 It shows that the growth options of Amazon and Facebook both exceed the total market capitalization of Oracle most of which comes from assets in place. This drives home how valuable Mr. Bezos and Mr. Zuckerberg are to their respective companies. The innovations related to their leadership are assoicated with hundreds of billions of market value. Nonetheless, compared to the $106.5 million paid the Mr. Hurd and Ms. Catz, Mr. Bezos, annual compensation is less than $2 million while Mr. Zuckerberg’s take home a lofty $1. Talk about a bargain. Next PostWhat Mr. Buffett "Understands"